When Dish Network unveiled it’s AirTV at CES 2017 this year it promised to bring streaming and broadcast TV together in one device. I’ve been using the new AirTV for about 2 weeks now and want to go over the my experience so you can decide if this is the device you’ve been waiting for. AirTV is an android TV based streaming device from the makers of Sling TV. It also includes an option for a TV Antenna adapter. This allows channels received from your antenna to be shown in the same interface as your streaming services. You can purchase AirTV in two flavors; A straight up Android TV device for $99, or the device with an OTA adapter for watching TV channels received from an antenna. The latter costs $129.99. If you opt to purchase just the AirTV Android box, you can add the OTA adapter later for $39.99. Therefore, buying both up front will save you $10. Both can be ordered through Dish’s AirTV website. AirTV also comes with $50 of Sling TV credits, so you can add a month or two of Sling TV free when you purchase AirTV. Although, Sling TV isn’t required to use the device. AirTV function’s using apps you can download from Google Play Store. This allows services like Hulu, Netflix, and HBO Now to also be used on AirTV. Ultimately, it works like any other streaming device. The AirTV was surprisingly easy to set up. I purchased the $129 version with the USB antenna adapter. Everything you will need is included in the box, even batteries for the remote and an HDMI cable. Of course, you will need your own antenna. If you do not have one, you can check out my article for finding the best TV antenna based on your situation. Connect the coaxial cable from your antenna to the coaxial connection on the adapter. Connect the power adapter to power the device and turn on your AirTV using the included remote. Once powered, AirTV walks you through each part of the setup step by step. It easily connects the device to your network, links you to your Google Play account, and scans your antenna for local channels. It even auto-discovered my TV and audio setup. Therefore, my AirTV remote was able to control the volume and power on my TV without extra programming. Obviously, if you purchased the $99 AirTV without the antenna adapter, you can skip the steps regarding the antenna. 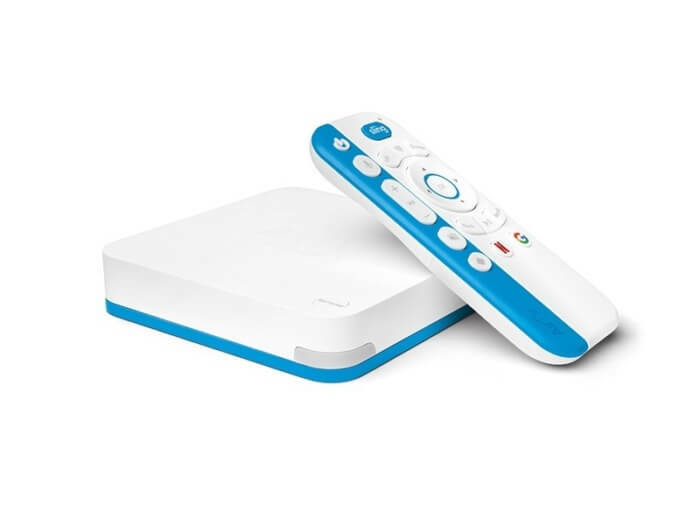 AirTV, then functions like any other Android TV box. As Dish is made by AirTV, the Interface is anchored in the companies Sling TV interface. From this interface, you have access to not only Sling TV content, but Netflix content, and your local OTA channels as well. Provided, you have hooked up an antenna to your AirTV. Furthermore, you don’t have to be a Sling TV subscriber for the menu to work. You simply won’t have access to Sling TV content. Although, purchasing an AirTV will come with a promo code for $50 worth of Sling TV. 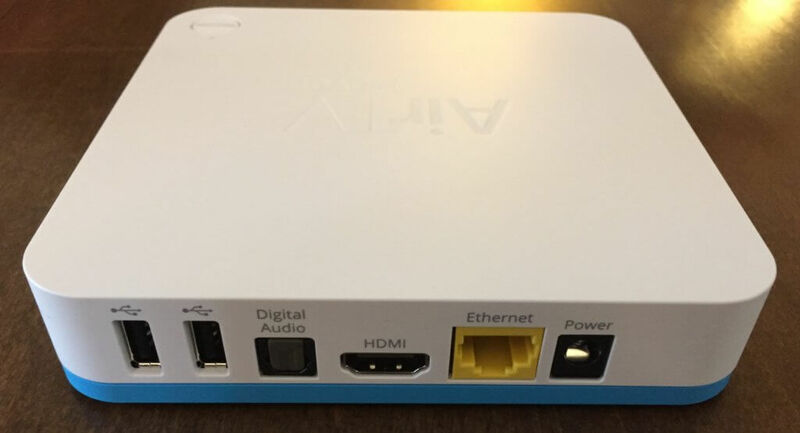 As stated earlier, AirTV is an android TV box. Therefore, anything you can install from the Google play store can be installed on your AirTV. Once installed, they appear at the bottom of the main interface. Those not familiar with Sling TVs interface may find it a bit awkward to use at fist, but after a few days the menu’s become intuitive. AirTV menu responsiveness is impressive. Navigation feels near instant. Furthermore, load times are minimal for the apps I have experimented with. As far as load times and responsiveness, AirTV is at least on par with Roku. AirTV is a well made streaming device. It holds it’s own against all the major players in the industry. Furthermore, AirTV features a robust voice search that works with Google Play Store. However, one thing that set’s it apart is the remote. The AirTV remote allows you to control the volume and power on your television. While that’s a simple enough concept, AirTV is the first major streaming device to seamlessly implement this feature. The remote includes a voice search microphone. There is also a locator button on the AirTV that pings the remote in case you can’t find it. This feature is a must if you have kids. Another excellent feature included with AirTV is Chromecast Built-in. This lets you “cast” content from a Google Chrome browser right to your TV. While many apps already support Chromecast, you can also watch browser based content using Google Chrome with the Chrome Buit-In extension. Anything you can watch on a PC or Mac, you can now watch on TV by casting to the AirTV. I’m personally enjoying the AirTV. Since it’s an Android TV box, it has a lot of versatility through installing apps from the Google Play Store. If you are a Sling TV user, it’s the device to have for the convenience of the interface alone. Add in the OTA TV and choosing this device is a no brainer. As for performance, apps and content load quickly. The menu navigation is extremely responsive, and I haven’t experienced a single crash in the 2 weeks I’ve used the device. Aside from having antenna TV and streaming all in one device, my favorite feature is easily the remote. I’m able to control my TV volume and power while loading apps with the same remote. Typically, you would need to purchase a universal remote to do this with other streamers. The only thing it’s missing is a headphone jack for quiet listening. The only drawback is really one of android TV. That’s the lack of iTunes and Amazon Instant Video. iTunes is expected as Apple is a walled garden. However, the lack of an Amazon Instant Video app is a problem for many, myself included. That said, there is a workaround. You can use Chromecast Built-In to cast your Amazon content to the TV with a Chrome browser. It’s not the best solution as it forces you to rely on 2 devices, but it’s all we can do for now. In the past, you could “side load” the Amazon Instant Video app, however, Amazon has been cracking down on that. They recently released an Android app for the nVidia Shield. Hopefully it will be available in the Google Play Store soon. If you take full advantage of what AirTV offers by combining it with an antenna, then I recommend it. However, if you are just looking for a streaming device, I’d stick with Roku. For those wanting to look into getting a TV antenna, I’ve written a guide to help choose which an antenna is the best based on your situation. However, installation of an antenna may be a different story. Luckily, dish will help you with that as well. You can have a Dish technician come to your house to have the antenna installed.